Like so many, I am mourning the loss of actress, comedian and writer, Anne Meara. Partnered in every sense of the word with Jerry Stiller (whose autobiography is called Married to Laughter: A Love Story Featuring Anne Meara), her husband of 61 years, she brought smiles to all of us, but there was so much more to her career than many of us appreciated. She and Jerry also generously gifted the world with their chip-off-the-old-block children, Amy and Ben Stiller. Scanning the countless comments on her passing, one can't help but notice the number of Irish Americans who felt compelled to share their grief. That's because she's familiar to us. So many of us were raised by tall, whip-smart, no-nonsense (but soft inside), Irish American moms that Anne Meara always felt like home. Her own Irish Catholic upbringing -- steeped in a world of parochial schools, Knights of Columbus, and priestly relatives -- was unkind to her (for insight and a taste of her writing talent, read Old Nuns), but it undoubtedly shaped her. And so, as a modest tribute, I'd like to share some bits and pieces of her family history. Anne Meara's heritage is 100% Irish and the names that feature in her family tree include Breslin, Dempsey, Donovan, Driscoll, Garrity, Harty, McLaughlin, Meara, Riley, and Shine. 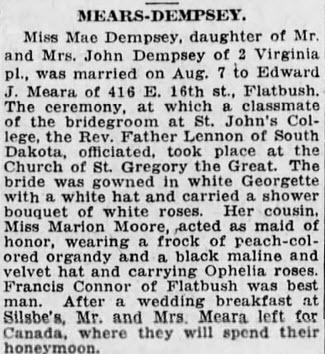 She was the only child of Edward J. Meara and Mae Dempsey, who married in Brooklyn in 1920. Her most recent immigrant ancestors were her paternal Meara grandparents who both arrived in the early 1880s. The couple had seven children, only two of whom survived to adulthood. James Meara was initially a fireman before becoming a patrolman around 1891. Prudent and frugal, he invested in real estate, enabling him to retire in comfort in 1913 after 21 years on the force. James Meara's carefully laid plans probably didn't prepare him for the events of 1914. On May 4th, he became a widower and on May 5th, he became a grandfather for the first time. His response to the sudden changes in his life? Take his son, daughter, and new-born grandson on a trans-Atlantic journey to the old country via Liverpool, England. But fate wasn't done playing with him yet. On August 4th, Great Britain declared war on Germany, so James and his family traversed the ocean back to New York just nine days later. Anne's maternal immigrant ancestors - three great-grandparents and a pair of great-great-grandparents - had come to New York decades before her paternal relatives. In fact, her first American-born ancestor was a great-grandmother named Mary Riley who was born in Brooklyn around 1847. Several generations of Anne's maternal Dempsey family are all buried together, ranging from her mother to her immigrant great-grandfather, Cornelius Dempsey. Cornelius had arrived in 1851 on the Western World, and rather unexpectedly for a passenger record of this era, reveals that he was from Cork. Thanks to a free website provided by the Irish Government (irishgenealogy.ie), it is possible to trace Cornelius to Drimoleague (aka Dromdaleague) in County Cork where he was born around 1827. He was the eldest of at least 11 children born to James Dempsey and Mary Donovan, who had married there on June 23, 1825. Though it's difficult to make out, their marriage record seems to indicate that James was from Myross. Anne could be called pan-Irish since her roots are scattered across the country. Though it would take additional research to confirm conclusively, there is strong evidence that Counties Donegal and Tipperary have, like Cork, contributed to her family tree, and there's one more branch of immigrants whose specific Irish origins are as of yet unknown. 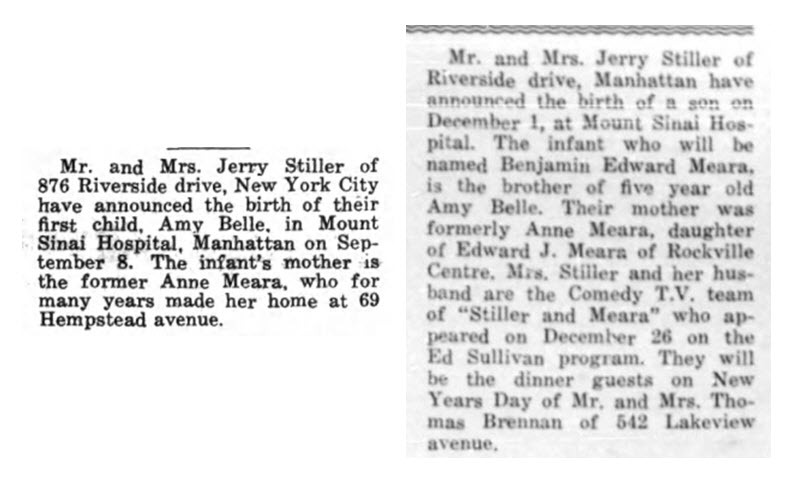 Anne Meara was likely acquainted with much, but not all of the details shared here, but I suspect that the most meaningful part of her family history -- aside perhaps from her 1953 marriage to Jerry Stiller -- was the births of their children, Amy and Ben, both proudly announced in the local paper.